Let me begin by saying that I hate cauliflower. Let me next say that if there’s a vegetable you hate, roast it and you just might change your mind! I also tried it with a little Daiya Vegan cheese on top for a different texture. I love this stuff because it actually melts, unlike many other vegan cheeses. In the photo it’s not really melted because I snapped it as soon as I put everything on the plate. The Huy Fong Sriracha sauce just made this perfect because I love everything spicy. This is a great side dish, or a lovely snack on those nights you don’t really feel like eating a lot or putting in a lot of effort. Preheat oven to 400. Cut cauliflower into florets and place into a medium mixing bowl. Drizzle olive oil over florets, add garlic and toss. Sprinkle with cumin, coriander, black pepper and crushed red pepper, then toss again to evenly coat. Spread florets evenly onto a cookie sheet sprayed with non-stick spray. Roast for 25 minutes, or until slightly browned and soft. 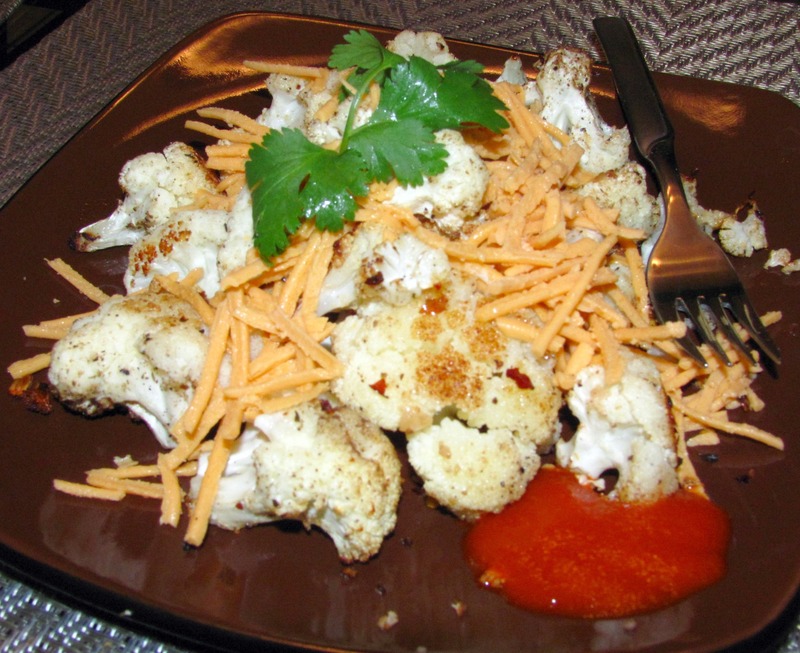 Top each serving with 1/4 cup Daiya vegan cheese in either their mozzarella or cheddar flavor. I used cheddar tonight.